Book Review: Crossroads…It’s about Time | Expressing Unconditionally...!! You all must be wondering why I’m taking this Oath before this Book Review only? So, It’s because this Book is something really close to my heart and by this oath I’m trying to tell myself that by any means I should not be biased on this on review. 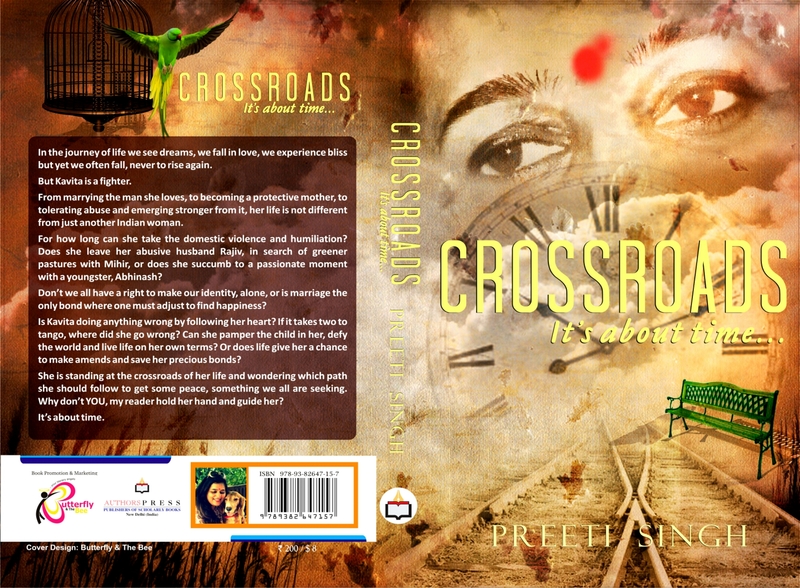 Finally I got time to update my review about Preeti Singh’s second most happening book Crossroads…It’s about Time. After the success of her award winning debut crime fiction thriller Flirting With Fate, Preeti Singh has emerged with a new genre…an emotional saga meant to touch hearts. Crossroads is something really different from all the novels out there in the market because it has all the Live characters of real life, some of them being your friends too. Picked up randomly from her friend list, Preeti Singh has given each person a platform in her second book. Another unique feature of this book is that she has used the names of all the Chapters from titles of great novels of other published authors. I, myself am also characterized as the Daughter of the Protagonist Kavita Tiwade. As we come to the story, It’s all about how an Indian Woman is dealing with her unsuccessful married life and how she can successfully and bravely come out of it. But the question she faces is…does she want to ? Does she choose someone else or stays back and endures her life due to her child? Each Woman can easily relate herself to this story at some or the other phase of it. The book contains high ranging emotions and touches the right corners of the heart. The book never leaves you alone for a moment and all the characters keep you involved in the story. The story has moments of Ups and Downs a lady faces in her life and all the characters are adding the life to the story. Each chapter is giving a beautiful end to a story. One best thing about this Author is her narration to the story and her way to give life to each character of her story. Even to the mute characters like Amber, Twitter, Amberina and Suno ji who are the animal companions of Kavita have an active and effective role. The shift from the past and present is an easy read and the intimate scenes are very gracefully defined without any vulgarity. Being an avid reader and reviewer, things which I personally did not like was the unnecessary stretch of the story in the middle and the dumb nature of kavita in the starting. As we hardly find any lady so dumb in nature in today’s era. But as I know the author personally, I can very well relate her with the character as each author puts some of their life into the book. Inspite of a few editorial mistakes which is the publisher’s fault I will suggest you all to please buy this book on priority and give it a read. I’m sure you won’t regret been the part of Kavita’s Journey. I wish to read more from you Preeti MAA and wish you all the best for your future endeavors. Love you stay blessed. In the journey of life we see dreams, we fall in love, we experience bliss but yet we often fall, never to rise again. But Kavita is a fighter. From marrying the man she loves, to becoming a protective mother, to tolerating abuse and emerging stronger from it, Kavita’s life is not different from just another Indian woman. Till how long can she take the domestic violence and humiliation? Does Kavita leave her abusive husband Rajiv, in search of greener pastures with Mihir or does she succumb to a passionate moment with a youngster, Abhinash ? Don’t we all have a right to make our identity, alone, or is marriage the only bond where one must adjust to find happiness? Is Kavita doing wrong by following her heart? If it takes two to tango, where did she go wrong? Can she unpeel the child in her, defy the world and live life on her own terms? Or does life give her a chance to make amends and save her precious bonds? She is standing at a crossroads of her life and wondering which path should she follow to get some peace, something we all are seeking. Why don’t YOU, my reader hold her hand and guide her? I well written review !! Keep up the good work..